My goal has always been to be a better reader. In college I wanted to read the assigned books with discernment, but ended up skimming to find required information. I made good grades, so continued that “skimming” habit far too long. Now my goal is to read more and genuinely search into what I read–dig deeper and mine the gold nuggets. This would especially apply to my Scripture reading. If I am blessed with good health, I hope to continue my present schedule, following my husband everywhere. It is easy to see that human lifespan is limited and life is too short to miss a minute with my mate. Kuthi Muthu was with the church at Lock Street for as long as I can remember. In her younger years, she was married to leper and bore him eight children, yet she never contracted leprosy. I can’t remember her ever being ill enough to have to go to the hospital. She was a winner. Unfortunately she and her husband did not rear their children in the Lord because they did not know about the church until the children had grown up. As she aged and became a widow, she sometimes spoke of being cold during the rain season. That complaint was easy to understand, because I too felt the cool dampness even in my house during the monsoons. I gave her a sweater and hoped it would warm her. Then one day she came saying her stomach hurt and she needed help to feel better. We took her to the local hospital where she was admitted for a few days for observation. The doctors there claimed she had cancer and sent her home to die. Not willing to give up so soon, we took her to another hospital in the area where we were told the same thing, except that these claimed she was too old to treat. 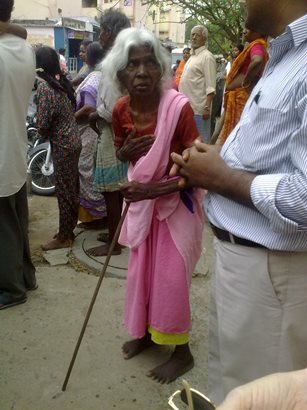 After trying four more hospitals, we finally took her to an elderly lady doctor in the village who had sympathy enough to try to find out what Kuthu Muthu’s trouble might be. The diagnosis was related to her feet and legs and she she was treated for tropical Filariasis (sometimes called elephantitis). It obviously affected her stomach too. A younger teacher at CTTS volunteered to carry her breakfast every morning along with the prescribed tablets for treatment. The medicine was harsh and she seemed to grow weaker and sicker quickly. The young man continued to monitor her and give what the doctor prescribed. One day she fainted and sustained a rather nasty bruise and cut to her head. Not one of them wanted to take care of her in her old age! Mind you a son and his family had moved into her house–supposedly for that purpose, but they would not even give her a cup of tea in the mornings, nor would they feed her anything but waste food. Students and teachers from CTTS took it upon themselves to be sure she ate three meals a day and had the medicine she needed. We could not assume her family would allow her access to good food or medicine even if we sent it there, so this had to be part of our personal daily ministry. It was literally a trip to find her three times a day and give her what she needed–our chance to be used by the Lord to visit the widow in her affliction…(James 1:27). Finding Kuthi Muthu was not always easy. She learned early to avoid the brutality at home, so she walked, and walked, and walked from morning until late at night. There were times we found her on the roof top of her four story apartment building. She lived on the third floor, so going up one more floor by the stair was nothing to her. Later, when someone blocked the stairs, she used the metal ladder bars outside the apartments to climb all the way up the apartment walls. She said sitting in the summer tropical sun was better than listening to the fighting in her home (Prov. 21:19). One day she complained about never having a chance to rest in her own house and cried about the treatment she was getting. Someone asked her if that gave her a chance to return good for evil, and she agreed it did (Matt. 7:12; Luke 6:31). She was willing to be defrauded (1 Cor. 6:7). 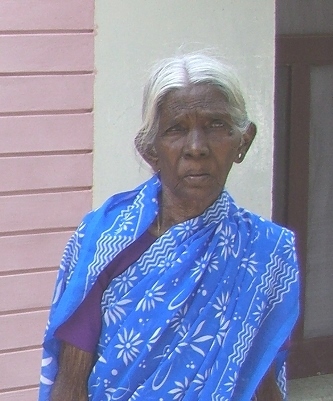 There were so many trials during those last years, but Kuthi Muthu seemed to conquor her temptations and remain strong. We too had trials along with her and were often tempted to give up, but the journey was a blessing for all of us. She passed from this life last month and many will miss her sweet, yet strong will to do what was right. “Lest there be any fornicator, or profane person, as Esau, who for one morsel of meat sold his birthright. For ye know how that afterward, when he would have inherited the blessing, he was rejected: for he found no place of repentance, though he sought it carefully with tears” (Heb. 12:16-17). The son of Isaac and Rebekah, Esau was also the twin brother of Jacob. In later life, he was known as Edom, the ancestor of the Edomites (Gen. 25:24-28; Deut. 2:4-8). His name was given because of the hairy covering on his body at birth: “all over like a hairy garment” (Gen. 25:25). The relationship Esau’s descendants had to those of Jacob was prophesied before the twins were born (Gen. 25:23). Even the moment of Esau’s birth signaled the same destiny (Gen. 25:26). Scriptural accounts of Esau draw a great contrast between him and his brother Jacob. Esau was a rough, hairy man and a cunning hunter favored by Isaac, while Jacob was a plain man dwelling in tents and favored by Rebekah (Gen. 25:27-28). Even though he was a twin, Esau was considered to be the eldest son because he was born first. The firstborn was expected to become head of the family, and take charge of the family property. Naturally he was responsible for the maintenance of the younger sons, the widows, and the unmarried daughters not only as their provider and overseer, but also as their spiritual leader. Furthermore, he generally received the blessing, which placed him in a favored position with the Heavenly Father. Esau sinned greatly by treating his birthright so casually and selling it for a meal. In a foolish, impulsive moment, Esau sold his birthright to Jacob in exchange for “bread and pottage of lentils” (Gen. 25:29-34). Later we see he also lost the benefit of his father’s blessing (Gen. 27:36) —two things virtually guaranteed the first born son in ancient oriental culture as well as in the Old Testament scriptures. After Israel (Jacob’s descendants) became a nation, we see the birthright included a double portion of the father’s assets upon his death (Deut. 21:17). The inheritance rights of the firstborn were protected by law, so the father could not give his benefits to a younger son (Deut. 21:15-17). Birthrights and blessings were not the same. The birthright carried with it the inheritance of property, while the blessing was an additional benefit which the patriarchs usually bestowed upon their children just before their own deaths (Gen. 49:1-28). Even if they spoke by mistake, once a blessing was given it could not be taken back (Gen. 27). Esau basically had his priorities wrong. Like the majority of the world’s population, he was simply living for the moment (1 Cor. 15:32). Unlike Moses who was willing to forsake the temporary pleasures of Egypt for a far greater eternal reward (Heb. 11:24-27), Esau wanted the temporary pleasure of a satisfied appetite. Esau said, “Behold, I am at the point to die: and what profit shall this birthright do to me” (Gen. 25:32)? He gave no thought to the consequences of his actions. His decision was illogical, foolish and wicked. The scriptures describe him as being a godless (profane) man (Heb. 12:16-17). We need to learn from him and think very carefully about the consequences of our own choices and decisions. “When thou sittest to eat with a ruler, consider diligently what is before thee: And put a knife to thy throat, if thou be a man given to appetite” (Prov. 23:1-2). “For the drunkard and the glutton shall come to poverty: and drowsiness shall clothe a man with rags” (Prov. 23:21). The temporary pleasure of a satisfied appetite has brought many a person to ruin (Prov. 5:3-6). The will of the Father in Heaven; spiritual desires (not the fleshly), the Lord’s church; the righteous commandments of God must come first (Matt. 6:33; Gal. 5:16-24; Psa. 119:172). Esau learned this lesson too late—which is also another lesson for us (Heb. 12:17). Sometimes the damage can’t be undone. The birthright for the oldest child was a special gift from God that he did not give to any but the firstborn. In relation to Christ, God’s firstborn, He showed man that He valued the firstborn above the others. We know how we respond when we offer a very special gift to someone, and they treat it like trash. God offered a very special gift to Esau, but he did not respect nor value God’s special gift—he treated it as if it were less value than a meal. God did not respond positively to Esau’s scorning His special offering. Figuratively speaking, the term firstborn stands for what is most excellent. This expression is applied to Jesus in several New Testament passages. All of them point to Jesus’ relationship to His Father and to the Church. Showing that Christ existed before creation and actually participated in the creation process (John 1:3), He is described as the “firstborn over all creation” (Col. 1:15). His virgin birth is depicted by the expression, “brought forth her firstborn son” (Matt 1:25). The phrase, “firstborn from the dead” (Col. 1:18; Rev. 1:5), refers to Jesus’ resurrection, which assures every Christian they also will have the same resurrection if they obey Him faithfully, even unto death. 1. By inspiration, the Hebrew writer tells what God thought of Esau for selling his birthright. Give the phrase used and the scripture reference. 2. How often do we covet food to the detriment of our souls and our health too? 3. What was prophesied to be the relationship between Esau’s descendants had to those of his younger brother (Gen. 25:23)? 4. What sign was given as the twins were born that signaled that relationship (Gen. 25:26)? 5. RESEARCH QUESTION: Notice a strong comparison between the two brothers: “And the boys grew: and Esau was a cunning hunter, a man of the field; and Jacob was a plain man, dwelling in tents” (Gen. 25:27). What is the meaning of the word “plain” (Strong’s number 8535)? How does this word affect our understanding of the character of Jacob when compared to that of his elder brother Esau? 6. Gen 25:28 says, “And Isaac loved Esau, because he did eat of his venison: but Rebekah loved Jacob.” Consider the prophecy given to Rachel (Gen. 25:22-23; along with Rom. 9:10-14) and tell which parent might have had some justification for showing favoritism? 7. After Esau realized he had lost both the birthright and the blessing, what did he determine to do (Gen. 27:41)? 8. How did Rebekah determine to save the life of Jacob (Gen. 27:42-45)? 9. What other foolish thing did Esau do to displease God and his parents (Gen. 28:6, 8-9).)? 10. After the meeting between Jacob and Esau more than 20 years later, where did Esau go to live (Gen. 33:12-17)? 11. Jacob and Esau met again (Gen. 35:29)? What was the occasion? 12. How could a firstborn son lose his birthright (Gen. 25:29-34; Heb. 12:16; Gen. 35:22; 1 Chron. 5:1-2; 1 Chron. 26:10)? 13. Under the Law of Moses, if a man had two wives, and one was favored, could he give the birthright to the elder son of the favored wife (Deut. 21:15-17)? Why would such a law have been necessary? 14. Give the account of when a different patriarch gave the blessing to a younger son (Gen. 48:13-14, 17-19)? 15. Name the ways Christ was firstborn (Luke 2:7; Rom. 8:29; Col. 1:15; Col. 1:18; Heb. 12:23), and tell how God should respond to those who love (covet) and serve mammon and reject the gift of his Son (Matt. 6:24; Luke 16:13)?